Photo: PATH/Reuben Mwanza. Health workers Namakau Mubiana and Namayana Kamwi from Situlu Rural Health Post were recently trained on ZEIR and are able to use the tool for their immunisation services. The Catholic Medical Mission Board (CMMB) is a charity that has operated in Zambia since 1965 with the specific mandate to deliver sustainable, quality health solutions to women and children. In Zambia, CMMB works in Central, Copperbelt, Luapula, Lusaka, Northwestern and Western provinces under four projects in the health and community development sectors. In implementing all of its programmes, CMMB’s strength is partnership. The Children and Mothers Partnerships – or CHAMPS programme – provides life-saving medical care for pregnant women and newborns, while fighting disease and poverty. CMMB’s decision to partner with the Ministry of Health (MOH) and the BID Initiative to roll out the Zambia Electronic Immunisation Registry (ZEIR) to several health facilities in Western Province was a natural extension of its mission to benefit children in the province. In November 2017, two BID Initiative Implementation Specialists trained Mwandi District Health Office (DHO) and CMMB staff in the ZEIR app and its various functions. By the end of the training, the health staff used ZEIR in real time so the health centres could begin registering children as they came in for their growth monitoring or inoculations. The interactive training helped health workers begin integrating ZEIR into their daily tasks. CMMB supports nine health facilities in Mwandi district of Western Province and ZEIR was rolled out to all nine of them. As an organisation, CMMB is committed to improving maternal, neonatal and child health (MNCH) in Zambia. Tracking health indicators, especially those pertaining to MNCH has proved challenging because Mwandi is predominantly rural. The BID Initiative interventions, particularly ZEIR, will allow CMMB to improve newborn care and better track CMMB’s impact throughout the district. ZEIR adds to CMMB’s mobile health (mHealth) platform and equips community workers and volunteers with the tools they need to get healthcare to the last mile. BID’s partnership with CMMB demonstrates that interventions are scalable to other regions beyond Southern Province. “ZEIR is aligned with the MOH systems and tools, and we were confident that deploying such technology would be sustainable, would influence better [decision-making] at our end, and also benefit other stakeholders of the health service throughout Zambia,” says Elizabeth Mushinda from CMMB. CMMB looks forward to utilizing the data from ZEIR to better gauge the support needed to improve immunization rates and follow up with patients who have recently missed a vaccine, thus reducing defaulters. ZEIR also empowers Mwandi DHO to plan for improved tracking of indicators, and delivery of vaccines. 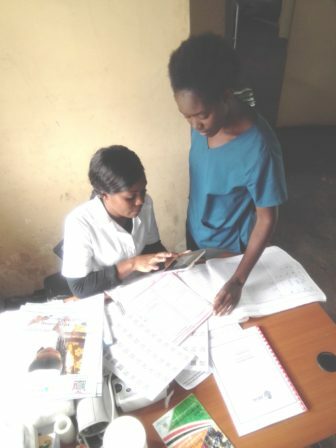 Improving primary health care in the district is one of CMMB’s objectives, and by building on data from ZEIR and mHealth, the organization can ensure better outreach services and improve access to care.